Help, how to topics > Library Main Catalogue > Sorting the library databases. To sort records means to change the order in which the records are displayed and printed. The underlying data structure of the file remains the same. Our library application uses one-level or multi-level sort, depending on the number of fields used in the sort definition. The sort functions can be accessed from the Default Sort Options, from the Popup Sort Commands, and by clicking on the Column Grid. Click the Sort (1) button to open the Default Sort Options. Move a mouse cursor over the Sort button to display popup message with the default ordering message (2). Set the default order in the Default Sort Options window. The default order is applied to the data every time you open the table. 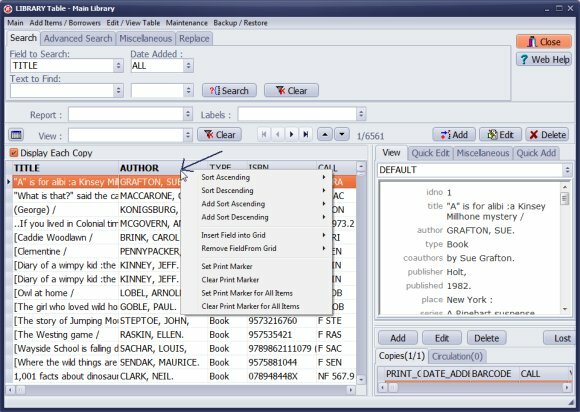 The sample window displays two level sort definition for the library main catalog. The TITLE is a primary sort field, and the AUTHOR is the secondary sort field. Click with the left mouse button on the column header to set the sort by this column. Click again to change the sort from ascending to descending. Click with the right mouse button on the column header to display popup menu. 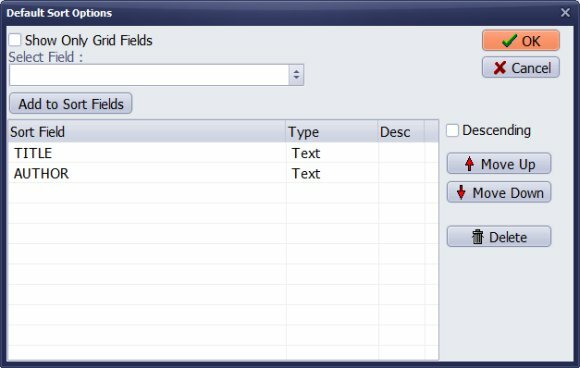 Popup sorting commands let you set order of your data by any column (data field) that is displayed on the grid. Use Sort Ascending or Sort Descending to set one level sort. Use Add Sort Ascending or Add Sort Descending to define multi-level sort. Quick sorting commands let you define a new order with data fields that are displayed on the grid. Question: Is it possible to generate a report sorted by multiple fields? If so, how do I do this? I want a report that has ID number, title, author, category and call number, sorted first by category and then id number. Answer: Select this label type. It has enough room for barcode, title, and library name.